The exiled political leader of the Palestinian radical group Hamas has warned of another uprising (intifada) by Palestinians. Khaled Meshaal said it would happen unless there was international agreement on a Palestinian state within six months. Mr Meshaal said Israel would have to withdraw to its pre-1967 borders. He was speaking in Cairo amid talks with Egyptian mediators on forming a Palestinian national unity government. Also on the agenda was a possible prisoner exchange with Israel. 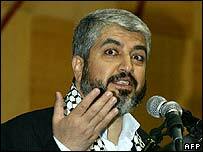 Mr Meshaal said Hamas would be prepared to co-operate on a ceasefire - including an end to missile attacks on Israel - if there was an Israeli commitment to withdraw to the borders that existed before the 1967 Arab-Israeli war. "We give the international community six months for real political horizons... There is a historic opportunity for a Palestinian state within 1967 borders," he told reporters. "Seize this opportunity. We will not be patient for longer than we have been. If our demands are not met, the Palestinian people will close all political files and launch a third intifada. "The conflict will be open and the victory in this conflict will be ours." Israel seized the West Bank from Jordan and the Gaza Strip from Egypt in the June 1967 war. Mr Meshaal, who is based in the Syrian capital, Damascus, said all Palestinian groups and Arab states agreed Israel should withdraw to borders that existed before the war. The BBC's Heba Saleh in Cairo says Mr Meshaal was referring to the initiative of 2002, which offered Israel normal relations with all Arab states if it withdrew from lands occupied in 1967. Israel has repeatedly rejected the offer. "As for the missiles, I have spoken about this before. Palestine is willing to co-operate on the issue, stopping missile attacks in exchange for Israel stopping its attacks on Gaza and the West Bank," Mr Meshaal said. "With regards to a ceasefire, it should be placed in the context of a political negotiation that allows Palestinians to feel that they have a chance to regain their rights."